This book is intended primarily as a handbook for engineers who must design practical systems. Its primary goal is to discuss model development in sufficient detail so that the reader may design an estimator that meets all application requirements and is robust to modeling assumptions. Since it is sometimes difficult to a priori determine the best model structure, use of exploratory data analysis to define model structure is discussed. Methods for deciding on the “best” model are also presented. A second goal is to present little known extensions of least squares estimation or Kalman filtering that provide guidance on model structure and parameters, or make the estimator more robust to changes in real-world behavior. A third goal is discussion of implementation issues that make the estimator more accurate or efficient, or that make it flexible so that model alternatives can be easily compared. The fourth goal is to provide the designer/analyst with guidance in evaluating estimator performance and in determining/correcting problems. The final goal is to provide a subroutine library that simplifies implementation, and flexible general purpose high-level drivers that allow both easy analysis of alternative models and access to extensions of the basic filtering. Supplemental materials and up-to-date errata are downloadable at http://booksupport.wiley.com. BRUCE P. GIBBS has forty-one years of experience applying estimation and control theory to applications for NASA, the Department of Defense, the Department of Energy, the National Science Foundation, and private industry. He is currently a consulting scientist at Carr Astronautics, where he designs image navigation software for the GOES-R geosynchronous weather satellite. Gibbs previously developed similar systems for the GOES-NOP weather satellites and GPS. 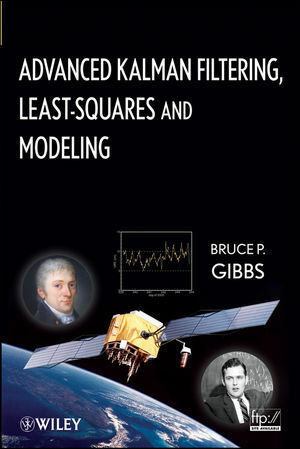 Discusses model development in sufficient detail so that the reader may design an estimator that meets all application requirements and is robust to modeling assumptions. Discusses implementation issues that make the estimator more accurate or efficient, or that make it flexible so that model alternatives can be easily compared.